Home :: Anklets :: AN014 - Fish on the Line! - 10"
AN014 - Fish on the Line! 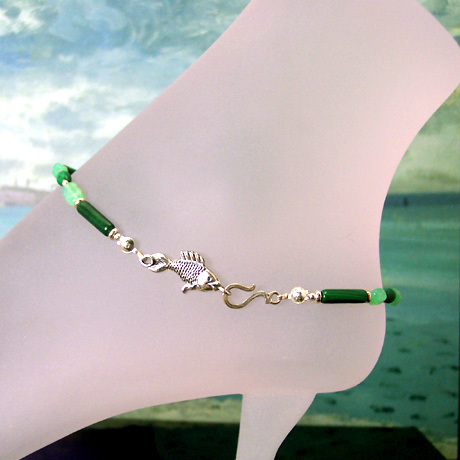 - 10"
Anklet made of 4-6 mm Chrysoprase nuggets, 4x6 mm oval & 4 x 14 mm tube Malachite, 3 mm Ster. Silver Donut, 2 mm seamless round Sterling Silver beads. Hand strung on Silk thread and finished off with a Sterling Silver Fish hook and eye clasp. One of a kind at this price!